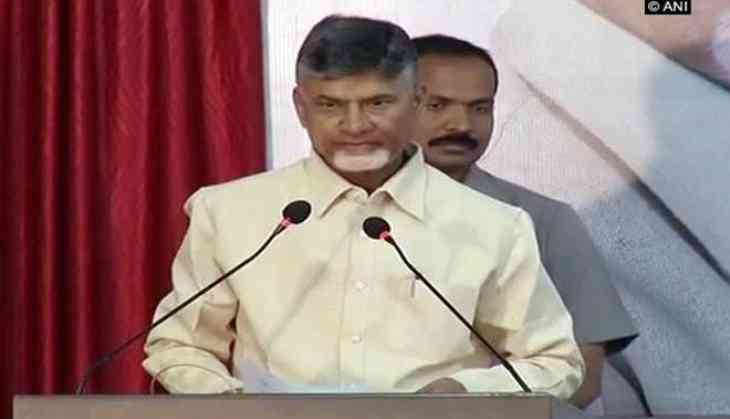 Chief Minister N. Chandrababu Naidu on Tuesday asked Prime Minister Narendra Modi to give an explanation to the people of Andhra Pradesh for betraying the state by denying Special Category Status and by not keeping a host of promises made in the AP Reorganisation Act 2014. Addressing the second 'Dharma Poratam Deeksha' in Vizag against the 'Betrayal - Conspiracy Politics', Chief Minister Naidu said it is high that time people of the state should fight against the Centre over its injustice. "Prime Minister Modi has to explain to the people of Andhra Pradesh that why his government went back on its promise of according Special Category Status to the state," he said. Saying that the Bharatiya Janata Party (BJP) will soon take the position of the Congress in the country, referring to the diminishing political presence of the grand old party in the nation, he said, "BJP tasted defeat already in the Karnataka elections, the BJP knows the situation in the southern states." Stating that Prime Minister Modi gave an assurances to the people of the state during his Prime Ministerial campaigns in Tirupati, Naidu telecasted the corresponding speeches the Prime Minister made at the time to further validate his point. "Five crore people are inquiring about the promises of the BJP. Why is the BJP Government not accepting the special status for the state? TDP has given a no-confidence motion against Central Government that is why the country has responded. The Congress had pulled out the fabrications and now the BJP has cheated. They gave Rs 2500 crore for the Sardar Patel statue, but gave only Rs1500 crores to our capital." Naidu said. On Polavaram National Irrigation Project, he said it is his dream to complete the Polavaram Project and assured that he would fulfill the dream as well. Referring to the controversy over a diamond of the Lord Venkateswara temple in Tirumala, he opined that the former chief priest and the former Chief Secretary were being instigated by the Centre to indulge in mudslinging against the State government to create distrust among the people. "The BJP-led Centre tried to take over Lord Balaji temple in Tirupati through backdoor means by issuing orders by the archaeology department. When people resisted this move, BJP government stepped back. So now, they have resorted to a new conspiracy," he said. "To defame me and the state, BJP leaders called Ramana Deekshitulu (ex-chief priest of Tirupati Balaji temple) to Delhi and using him for spreading baseless allegations. Many committees in the past have clarified that it was ruby and not diamond (referring to the allegation on the pink diamond). Even IYR Krishna Rao (former IAS Officer) reported that it was not a diamond. All this is part of BJP's conspiracies," he added. He then pointed out the various 'shortcomings' of the BJP government, saying, "The common man is still facing problems due to demonetisation but the Centre is not able to solve these problems. GST was not being implemented properly. Attacks are happening on SC/STs and minorities. Atrocities are on the rise against women. BJP leaders are coming out to support these people who are accused of violence against women."